We love our vegetables and don't really have a problem reaching our daily quota of 5-a-day. I for one am happy to eat lots of them raw and throughout this blog there are many posts dealing with vegetables in their natural state, for example the Simple Asian Carrot Salad or the Prawn and Mango Salad or carpaccio of kohlrabi. Of course its not always possible or appropriate to eat vegetables without cooking them so as a plan B we would generally recommend roasting or baking. 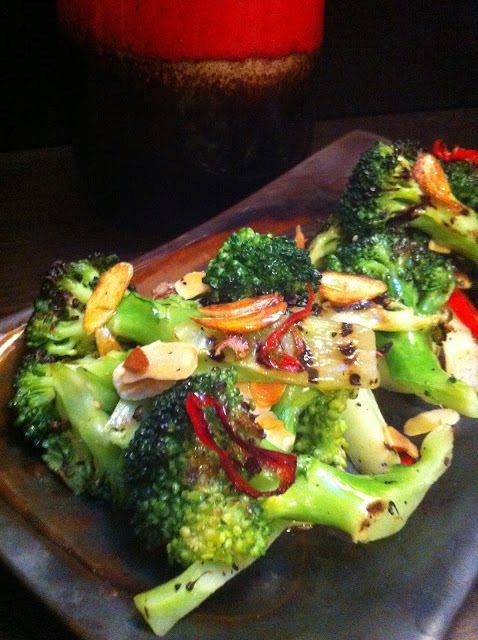 Char grilled broccoli with flaked almond, garlic and chilli dressing. Oven cooking brings out the natural sugars in most vegetables enhancing and intensifying their essential tastes and flavours but another method easily rivalling and perhaps even surpassing this wonderful caramelisation is to char grill. Here in this post we suggest two vegetables broccoli and baby aubergines. The former requires blanching (we think steaming is preferable) for a brief period and we mean brief, probably no more than two minutes maximum, whilst the latter can be placed directly on the char grill and cooked in one go. These two are only examples for illustrative purposes. Other vegetables which would work well are asparagus, courgettes, sweet potatoes, artichokes, fennel, red onions, spring onions, french beans.... the list is almost inexhaustible limited only by the boundaries of your imagination. 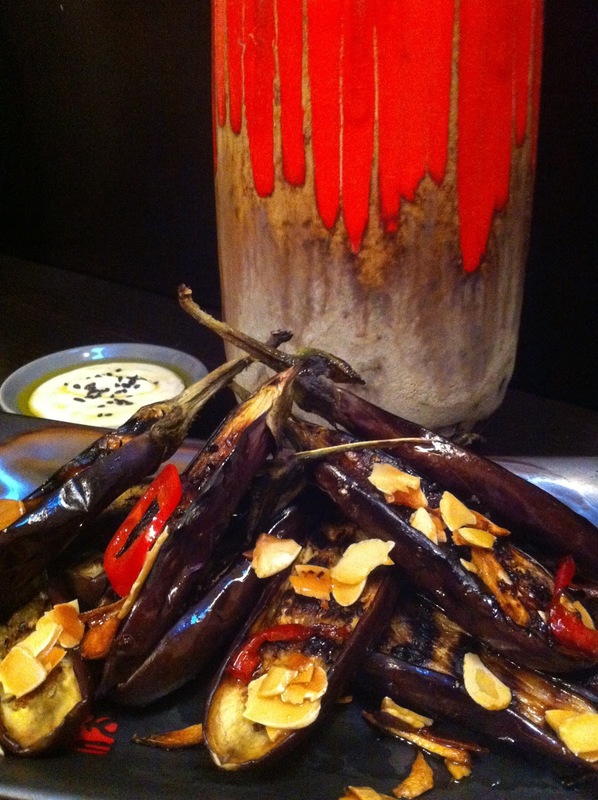 Char grilled baby aubergines with a tahini dip. There are just a few simple rules to follow. Vegetables should be sliced with at least one flat edge which allows maximum contact with the grilling pan and should be no more than a few millimetres thick. Those vegetables which require blanching, for example broccoli or fennel should be given short sharp shocks. Greens should be plunged into ice cold water following a brief steam to preserve their colour and then allowed to dry. All vegetables should be as dry as possible before being placed on the grill. Try to position the vegetables in such a way as to maximise the effect of the strips the grill pan will make. The pan itself should be smoking hot and a high heat maintained throughout the cooking process. Two or three minutes each side should be adequate but check the underside to see how it is doing. The intention is to burn but only up to the point where the flavour is enhanced by the caramelisation. If using any oil brush it on the vegetable not on the pan to prevent excessive smoking. Finally a good dressing is essential in the case of the broccoli we suggest heating a little olive oil on a pan and frying some sliced cloves of garlic, chilli and flaked almonds until golden brown. Add a few drops of nut oil eg. hazelnut or walnut for an extra nutty flavour and seasoning. For the aubergine we recommend a tahini dip consisting of tahini paste, olive oil, sweet vinegar, yoghurt, honey salt and a garnish of sesame seeds.